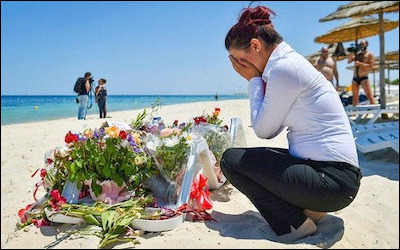 A British tourist mourns at the site of one of Tunisia's worst acts of terrorism, the murder of thirty-eight people at the seaside resort of Sousse. Jihadism is on the upswing in Tunisia and threatens to undermine the fragile political order that emerged in the aftermath of the 2011 revolution. On June 26, 2015, a lone gunman attacked a beachfront hotel in the Tunisian city of Sousse, exclusively targeting foreign tourists. By the time he was shot to death by the security forces, the 23-year-old Seifeddine Rezgui had murdered thirty-eight people, many of them British tourists vacationing in the seaside resort. The Islamic State of Iraq and Syria (ISIS) quickly claimed responsibility for the atrocity. One of the worst in Tunisian history, the attack occurred just over three months after the killing of twenty-two people (including seventeen foreign nationals) at the Bardo National Museum in the capital city of Tunis. While both attacks were clearly aimed at Tunisia's tourist industry, a vital source of foreign revenue that had been struggling to regain its footing since the 2010-11 revolution, they also threatened to undermine Tunisia's tenuous democratic system established in the years following the revolution. 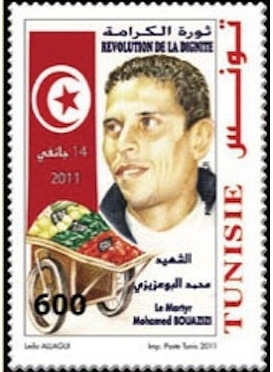 A Tunisian stamp honoring Muhammad Bouazizi, a 26-year- old fruit and vegetable vendor, who set himself on fire in an act of protest in December 2010. Deteriorating socioeconomic conditions along with resentment against a corrupt regime unleashed a torrent of anger against the government, and Bouazizi's protest ignited a revolution that swept away a decades-old dictatorship. The uprising was triggered in December 2010 by the self-immolation of Muhammad Bouazizi, a 26-year-old fruit and vegetable vendor from the minor town of Sidi Bou Zid, who set himself on fire in front of the local government offices in a desperate act of protest. While he was not the first Tunisian to embrace such a desperate act, his image reverberated across diverse segments of Tunisian society. Mounting frustration over deteriorating socioeconomic conditions, along with rising resentment against a corrupt regime that seemed out of touch with the lives of ordinary Tunisians unleashed a torrent of anger against the government. Bouazizi was inaccurately presented on social media as an unemployed university graduate, forced to sell produce to support his family. This cyber image resonated with scores of young Tunisians, who, frustrated by their stalled economic progress, identified with this fictional image. Other segments of society sided with the frustrated, educated younger generation. These included the population of peripheral towns like Sidi Bou Zid, which took to the streets after Bouazizi's deed. Spontaneous protests spread across the country, reaching the capital in early January. Initial demands for social justice and improved economic opportunities gave way to unprecedented calls for President Ben Ali to step down. On January 13, 2011, the president delivered a televised address to the nation, in which he claimed that he "understood" the protesters, vowed to address their grievances and pledged not to seek reelection. These statements did little to calm the demonstrators, who returned to the streets of central Tunis the next day. By early evening of January 14, Tunisia's media announced that Ben Ali and his family had fled the country for Saudi Arabia where they received asylum. Tunisia has a tradition of political moderation and compromise and a homogeneous, well-educated society. News of Ben Ali's departure shocked the public. Few anticipated such an outcome, and many feared for the country's internal stability. At first, some of Ben Ali's cronies believed that political turmoil in the country had ended with the president's flight, that their own positions were secure, and that Tunisia would maintain its existing political structure. That assumption was quickly proved false by angry protesters who resumed their demonstrations, demanding that the Ben Ali regime be completely dismantled. From the demonstrators' perspective, the Tunisian revolution was far from over. As the protests intensified, the Tunisian military refused to intervene or suppress the demonstrations. The remaining officials of the Ben Ali regime ultimately relented; by early March, the ruling Rassemblement Constitutionnel Démocratique party was dismantled. A veteran Tunisian political figure, Beji Caid Essebsi, was appointed interim prime minister, and the country embarked on a transition process aimed at transforming the political system and establishing democracy. Tunisia's potential for restructuring its political system was considered high, owing in large part to features specific to the country. These include a tradition of political moderation and compromise and a homogeneous, well-educated society. The fact that the military largely removed itself from political life also suggested that, unlike other countries, the armed forces would not intervene. But the obstacles the country faced throughout the ensuing years were substantial and could potentially have disrupted these efforts at any phase. Tunisia also came under stress as a result of the revolution in nearby Libya, which sent thousands of refugees into its territory. On the domestic front, there was no guarantee that Tunisian society would be able to construct a bottom-up democratic system and navigate a process that would avoid a "winner takes all" mentality between rival political forces. A supporter waves the flag of the Islamist Ennahda party ahead of the 2011 elections. Ennahda, outlawed under the Ben Ali dictatorship, made a strong initial showing in Tunisia's first democratic elections. However, by 2013, with deepening economic issues, the party gave up control of the government, and new elections were scheduled. Difficult relations between Tunisia's Islamists and the secular forces that opposed them presented a major challenge to efforts to construct a new political system. The Ben Ali regime had taken an uncompromising position toward Islamist movements, particularly the most organized of them, the Ennahda (Renaissance) faction, whose activities were banned while thousands of its supporters and leaders had been imprisoned and tortured. Some of its leaders had gone into exile abroad, including the movement's leading figure, Rachid al-Ghannouchi. There was no way of knowing how the Islamist movement would fare under the changed political circumstances of a post-revolutionary state. Shortly after Ben Ali's flight, Ghannouchi indicated that he intended to return to Tunisia and reenter the political fray. He reiterated his more recent support for democracy and moderation, which contradicted his earlier, radical utterances. Given Ennahda's effective absence from public life for nearly twenty years, this was a political gamble on Ghannouchi's part. In hindsight, he demonstrated a shrewd grasp of the changed Tunisian political reality, and the enthusiastic welcome he received upon his return suggested his calculated risk had panned out. Within weeks, Ennahda emerged as a leading post-revolutionary political force while other opposition groups active in the Ben Ali era languished. 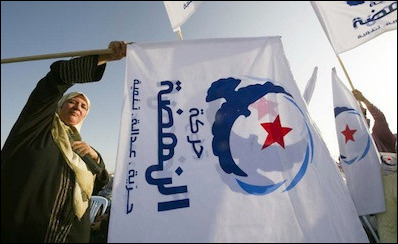 Ennahda's opponents were unable to offer a compelling ideological alternative to the Islamist movement and lacked the organizational structure to compete with it. Ennahda also established a widespread network of branches and offices, utilized informal public spaces across the country via mosques, and seemed poised to become a leading force in the emerging political landscape. The main focus of Tunisian politics in the latter months of 2011 was the effort to organize elections for a National Constituent Assembly. This assembly was to be entrusted with the task of framing a new constitution and establishing a democratic political order. The concept of free and transparent multiparty elections was unfamiliar to most Tunisians while the technical challenges of arranging such a vote were formidable. Assembly, which forced the leading parties to forge a coalition government. The reality of operating in a coalition further induced the need for political compromise. Voters appreciated that the Islamist Ennahda movement had not been "tainted" by involvement with the former regime. Ennahda fared very well among the electorate, garnering the greatest number of seats although not obtaining an outright majority. Voters appreciated the fact that the Islamist movement had not been "tainted" by involvement with the former regime and were willing to endorse it. Many voters also found the movement's stance on traditional values and its stated commitment to democracy appealing. Ennahda would have undoubtedly preferred to govern without partners but was forced to cooperate with others in an alliance of strange bedfellows. Its secular opponents endorsed other new parties, such as the left-leaning Congrés pour la république (CPR) led by veteran human rights activist Moncef Marzouki, and the center-left Ettaktatol (Democratic Forum for Labor and Liberties) party. The coalition government that emerged after the vote placed CPR leader Marzouki in the presidential palace while Ennahda was entrusted with leading the government, and Ettakatol was chosen to fill the assembly speaker's position. As the new government started its work, it immediately faced high—and unrealistic—expectations for quick improvements in the country's material situation. The economy, which had been faltering prior to 2011, was hard hit by the revolution. Most Tunisians expected the new government to provide immediate solutions to their economic plight, particularly in the area of unemployment and rising costs of living. But as much as the new government sought to revitalize the economy, its resources were limited. Even more experienced politicians would have found it difficult to obtain results in such a short period. As time went on, and with little improvement in the country's economy, the public's view of the government soured. Political tensions quickly emerged, clouding the transition process further. Public disappointment over the economic situation was compounded by increased tensions between Ennahda and the secularists. Although the Islamist party had failed to gain an outright majority in the 2011 elections, its strong showing emboldened its leaders. Ennahda sought to leave its mark on the emerging constitution and political system and considered itself to be in a good position to do so. Although its leaders continued to profess a support for democracy, they also sought to inject religious and traditional values into the debate on Tunisia's political future. Their opponents accused them of insincerity and inconsistency regarding democracy and for indirectly endorsing (or turning a blind eye to) extremist jihadist elements that appeared to be gaining traction. Nidaa Tounes supporters celebrate a victory. The Nidaa Tounes party galvanized anti-Ennahda voters, who resented the Islamists and had tired of the revolutionary fervor that had engulfed the country. Nidaa Tounes managed to gain 85 out of 217 seats in parliamentary elections and more than 55 percent of the vote in a run-off presidential election. It was no surprise then that this toxic brew of rising economic discontent and political ferment progressed to violence. The assassination of two secular, left-wing politicians in 2013 shocked the Tunisian public and signified that the transition process was faltering. Political assassinations had been largely absent from the country's political history, and their emergence in post-revolutionary Tunisia stoked fears that things were spiraling out of control. Ennahda's opponents increased their criticism of the Islamist-led government, arguing that the movement was turning Tunisia into a theocratic state. The secular-oriented public developed a stronger infrastructure with the establishment of the Nidaa Tounes (Tunisia Calls) party, led by Beji Caid Essebsi, the interim prime minister prior to the 2011 vote. The party soon vaulted to the forefront of anti-Islamist politics as Essebsi successfully tapped into the sentiments of a significant portion of the Tunisian public, which resented Ennahda and had tired of the revolutionary fervor that had engulfed the country. The veteran politician exhorted the public to restore Tunisia's republican ideals and recreate the spirit that he claimed underscored the country's early years of independence. Essebsi also strongly criticized Ennahda's Islamist convictions, which he argued undermined the very ideals he was seeking to revitalize. By 2013, the party had emerged as the rallying point for Ennahda's opponents. Public disappointment with the Islamist-led administration's overall performance and a lack of progress in framing a new constitution provided the backdrop to massive protests calling for the government's resignation in the summer of 2013. These demonstrations were clearly inspired by similar events in Egypt at that time, in which the Muslim Brotherhood-led government was overthrown by the military, backed by massive public protests in Cairo. The differences exhibited by Egypt and Tunisia during their separate transitional processes are instructive. Perhaps most glaring was the complete absence of the military from the turmoil in Tunisia and its noninterference in the political process. A second distinction was the relative strength of Tunisian civil society groups in managing this process, assuring that negotiations between rival sides over Tunisia's future political system remained on track. The role of Tunisia's powerful trade union was particularly instrumental in this regard. Another factor was Ennahda's apparent willingness—motivated more perhaps by cold political calculations and a realistic appraisal of its own standing than by inherent flexibility—to compromise at crucial moments. Thus, the events in Egypt, where widespread protests against the Muslim Brotherhood government ultimately evolved into a military intervention reverberated in Tunisia without shaking it to its core. Ennahda's opponents were clearly emboldened by the events to the east and were determined to bring down the government. In the end, Ennahda agreed to resign, provided that a timetable for new elections would be set, along with one for completing the work on a new constitution. In so doing, it averted a prolonged political crisis while guaranteeing it would remain a key political player. Its decision also reflected the quest for stability and consensual politics, which had historically underpinned Tunisian politics. The crisis of 2013, which threatened to derail post-revolutionary achievements, had been averted. A technocratic government led by Mehdi Jomaa, a former industry leader who had served in the Ennahda-led government, assumed responsibilities in September. As an interim, caretaker government, the Jomaa administration did, nevertheless, seek to improve the economic situation by reaching out to foreign investors and helping to prepare the country for new elections. Tunisia's success in ratifying a constitution was attributed to the strength of its civil society and the ability of rival groups to compromise. However, public pressure to reach an agreement over a new constitution intensified in the autumn of 2013, and talks over these issues, with the heavy involvement of the powerful trade unions, resumed. The lessons of summer 2013, in which Tunisia appeared to be on the brink of collapse, and the sense of urgency, which all parties shared, paved the way to an agreement. By January 2014, the National Constituent Assembly approved the draft of a new constitution. Tunisia's success in framing and ratifying it was attributed to the strength of its civil society, along with the ability of rival groups to compromise and maintain the country's tradition of consensual politics. The new constitution provided the blueprint for a reconfigured political system. It focused on a number of central issues, including the status of Islam, which the constitution has now defined as the state religion while simultaneously stating that the people are the source of political legitimacy. Critics have argued that the constitution's language in such matters was left intentionally vague in order to reach a compromise and facilitate its release for final approval. They assert that these vague definitions do not bode well for the country's political future and that the potential for constitutional disputes is high. The constitution guaranteed civil liberties including women's rights, something that Tunisia has historically embraced. Such disagreements were to be adjudicated by a constitutional court, perhaps the most important institution to be created in the new order. The creation of such a body, entrusted with supervising other branches of government and upholding the constitution, was unprecedented in the country's history. Given the court's past lack of independence, the extent of its ability to monitor, influence, and reject unconstitutional developments remains an open question. As with similar documents, the constitution also guaranteed a wide range of civil liberties including a special emphasis on women's rights, something that Tunisia has historically embraced. constitution stipulated that the parliament's powerful finance committee would always be led by an opposition party. The political structure outlined in the constitution, in sum, leaves a number of unsettled questions that could undermine efforts to establish a secure democratic polity. Most of these issues are expected to remain at the forefront of Tunisia's political agenda in the years to come. As 2014 drew to a close, Tunisia set out to choose new elected officials as outlined in the constitution, including a new president and parliament. But a sense of excitement or history-in-the-making did not materialize during the campaign. Most voters expressed limited interest in the competing parties and were indifferent to the candidates' efforts to fire them up. This seemed to indicate that many Tunisians were dissatisfied with the overall situation in the country and blamed the parties and leaders that had been at the helm since 2011 for the unsatisfactory way things had gone. Coalition leaders acknowledged their shortcomings while at the same time asserting that they were being unfairly blamed for the country's problems, which were complex and exceeded the capacity of any political party. Coalition party leaders kept a low profile throughout the elections season, opting to avoid confrontations with an angry populace. Tunisian president Beji Caid Essebsi (left) and U.S. president Barack Obama shake hands after a meeting in the White House, May 21, 2015. While Essebsi's Nidaa Tounes party did well in recent campaigns, the movement's future is unclear, with little beyond Essebsi's leadership to unite disparate elements within the movement. The one exception was the strong showing of the Nidaa Tounes party on the campaign trail. The group galvanized anti-Ennahda voters, who felt that they had found a voice that expressed their resentment with the Islamists They were inspired by leader Essebsi's pledge to restore Tunisia's former glory, viewing him as a responsible, experienced authority able to shepherd the country out of its transitional stage and inaugurate a new political order. Despite unanswered questions concerning the party's long-term viability, many Tunisian voters, particularly in the more prosperous coastal areas, endorsed it. Nidaa Tounes managed to gain 85 out of 217 seats in the new parliament and more than 55 percent of the vote in a run-off presidential election. Ennahda leaders conceded defeat after the 2014 parliamentary elections. Nevertheless, it would be inaccurate to conclude that the Islamist party has been fully rejected by voters, having managed to garner 69 parliament seats; it is expected to maintain its status as a significant player in Tunisian politics. After some initial hesitation, Nidaa Tounes' leaders overcame their reservations and invited Ennahda to join the government. The inclusion of the Islamist movement, even on a minimal scale, preserved the possibility of continued Islamist-secular political cooperation. In the months following Essebsi's election, the new Tunisian government set out to address immediate social and economic concerns. Seeking to gain greater international support, Essebsi reached out to Tunisia's foreign allies in an attempt to transform their verbal endorsements into more concrete support. The highlight of these efforts was his visit to the United States in May 2015, during which he met with President Obama, lawmakers, and policy experts. During the visit, Essebsi also publicized Tunisia's progress and future challenges in various media appearances. One further important development has been the work of the country's truth and reconciliation commission, entrusted with investigating cases of torture and abuse carried out by the Ben Ali regime. Dealing with these cases will presumably help Tunisian society turn the page and move on from that dark chapter in its history. While Tunisia's political crisis has subsided, other challenges loom, notably the large number of young Tunisians rushing to join ISIS's ranks having embraced an extremist ideology that is very much at odds with the prevailing norms of Tunisian politics and society. Other challenges loom for Tunisia, notably the large number of young Tunisians rushing to join ISIS. The jihadist violence committed at Sousse and the Bardo Museum was a shock to the national system. President Essebsi rushed to the seaside resort and promised new security procedures to thwart future attacks. Prime Minster Habib Essid announced further counterterrorism measures, including the closure of mosques suspected of incitement as well as the deployment of security forces around hotels and other tourist sites. On July 4, 2015, fearing criticism of the government's inability to provide sufficient security and avert attacks, President Essebsi declared a state of emergency for a 30-day period, allowing security forces to carry out raids against suspected targets and to keep tabs on the media. By most accounts, the number of Tunisian foreign fighters is one of the highest among those joining the conflicts in Syria and Iraq. More than three thousand Tunisians, most of them men under the age of thirty, have joined the battle. This flow is an unexpected and problematic consequence of the 2011 revolution. Some have attributed the large number of Tunisian volunteers to the impact of radical activists who took advantage of the post-revolutionary environment, enabling them to operate freely among dislocated young Tunisians. The families of these volunteers have claimed that they were naively lured to Syria and Iraq with promises of high wages in return for their services as well as for the glory of fighting for the sake of Islam. Many of them ended up disappointed with the reality they met in battle but have effectively been held captive by ISIS and other groups that confiscated their passports and have not allowed them to leave. Tunisian leaders have cited the lack of economic progress and the stubbornly high unemployment rates, combined with the impact of turmoil in neighboring Libya, as the driving forces behind the Tunisian decampment to ISIS. They have also asserted that they have managed to prevent thousands of Tunisians from travelling to ISIS battlegrounds and have argued that once economic and social conditions improve, ISIS and other jihadi-oriented groups will lose their appeal. While ISIS and its jihadist ideology have not yet attracted widespread appeal among the general Tunisian public, the impact of the returning "veterans" from Syria and Iraq remains a matter of concern. However, support for ISIS among young Tunisians appears to reflect a genuine ideological void in post-revolutionary Tunisia. While economic improvement could mitigate some of these groups' appeal, post-revolutionary politics and society will need to offer a more inspiring vision in order to meet the aspirations of younger Tunisians. The traditional clamor for stability will have to be complemented by a more compelling outlook for the country's future. For now, the jihadist appeal remains a troubling by-product of Tunisia's revolution, suggesting again that the country's journey is far from over. More than four years after its revolution, Tunisia has demonstrated impressive progress in transitioning to a new state. It has successfully framed a new constitution, held several elections largely bereft of irregularities, and has certainly fared better in comparison to other Arab states experiencing similar post-revolutionary transitions. Tunisia has certainly fared better than other Arab states experiencing similar post-revolutionary transitions. The Economist nominated Tunisia as "country of the year" in 2014, reflecting the Western appreciation of its recent accomplishments. But critical voices challenge that view. This criticism does not dismiss Tunisia's achievements but contends that the success paradigm disregards a more complex social and political reality. These new voices assert that many of Tunisia's venerable political and social foundations are a far cry from Western conceptions of democracy and are at the heart of the country's recent setbacks. Thus the traditional notions of consensus and institutional continuity are the real driving forces behind Tunisia's transition and are not in any way new. But critics warn that the quest for stability was also commonly invoked during the Ben Ali era and was ultimately used to justify many of the abuses associated with that regime. Therefore, securing Tunisia's much-vaunted consensus in the post-revolutionary era could result in stifling dissent and sanctifying the status quo. Indeed, an assessment of Tunisian politics in the first months of 2015 raises doubts about the success of the country's transition and its overall future. In the first few months of Essebsi's presidency, protests and strikes broke out in the south, the Tunisian revolution's birthplace. The government responded by promoting "unity" and "stability" at the expense of recognizing the protesters' grievances. The composition of the newly elected parliament, which is dominated by the more right-wing, conservative parties, has stifled political debate and alienated broad swaths of the population. Conditions for a healthy, pluralist, political order have not yet fully matured. Despite the popularity of the Nidaa Tounes throughout the parliamentary and presidential campaigns, its future remains unclear. The party incorporated diverse political currents that had little in common with each other except their opposition to Ennahda. During this period, its internal ranks were in disarray with little beyond Essebsi's leadership to unite them. Indeed, commentators asserted that too much of the party's political fortunes were linked to Essebsi's persona while the group's internal structures were weak. The recent terror attack in Sousse further compounds the country's challenges. The announced state of emergency raises concerns over the resurrection of a security state in the Ben Ali vein, in which the government towers over all aspects of public life, and dissent is effectively stifled. In the political arena, the question is far from settled over whether the present compromise between the more secular bloc led by Nidaa Tounes and the Islamist Ennahda will be sufficient for charting Tunisia's future. Pressing economic problems are at the top of the new government's agenda, but the Tunisian political system needs to offer a broader vision of the country's future in order to encourage large segments of the population. The coming months should indicate whether Tunisia will manage to address these challenges, or whether its new political order will collapse. It is hoped that the country's Western allies will assist it in various ways, but the ultimate decisions will have to be made by Tunisians themselves. Despite these concerns, there is still cause to be optimistic that Tunisia's history of moderation and compromise will continue to guide the country as it opens a new chapter in its history. Daniel Zisenwine is a visiting professor at Georgetown University's security studies program and the author of The Emergence of Nationalist Politics in Morocco (I.B.Tauis, 2010). The New York Times, June 26, 2015; BBC News, June 27, 2015. The New York Times, Mar. 18, 2015. Larbi Sadiki, "Tunisia's Constitution: Success Story?" al-Jazeera TV (Doha), Jan. 27, 2014; Alexis Arieff and Carla E. Humud, "Political Transition in Tunisia," Congressional Research Service, Washington, D.C., Oct. 22, 2014. Another Tunisian street vendor, Abdesslem Trimech, set himself on fire on Mar. 3, 2010; see Nouri Gana, "Introduction: Collaborative Revolution," The Making of the Tunisian Revolution: Contents, Architects, Prospects, ed. Nouri Gana (Edinburgh: Edinburgh University Press, 2013), p. 12. Le Monde (Paris), Jan. 5, 2011; Jean-Pierre Séréni, "Le réveil tunisien," Jan. 6, 2011; The New York Times, Jan. 13,14, 2011; Le Monde, Jan. 14, 2011; BBC News, June 17, 2011; Olivier Piot, "De l'indignation à la revolution," Le Monde Diplomatique (Paris), Feb. 2011. BBC News, Mar. 3, 2011; Alexis Arieff, "Political Transition in Tunisia," Congressional Research Service, Washington, D.C., Apr. 15, 2011. Mehdi Mabrouk, "A Revolution for Dignity and Freedom: Preliminary Observations on the Social and Cultural Background to the Tunisian Revolution," Journal of North African Studies, no. 4, 2011, pp. 625-35. Michael Collins Dunn, "The Al-Nahda Movement in Tunisia: From Renaissance to Revolution," Islamism and Secularism in North Africa, ed. John Ruedy (Washington: Georgetown University Press, 1994), pp. 149-65. Mahan Abedin, "Tunisia: Islamist Leader Returns from Exile: An Interview with Rashid al-Ghannouchi," Le Monde Diplomatique (English ed. ), Jan. 2011. Al-Jazeera TV, Nov. 10, 14, 2011; "National Constituent Assemble Elections in Tunisia, Oct. 23, 2011, Final Report," The National Democratic Institute, Washington, D.C.; al-Jazeera TV, Nov. 19, 2011; Bruce Maddy-Weitzman, "Historic Departure or Temporary Marriage? The Left-Islamist Alliance in Tunisia," Dynamics of Asymmetric Conflict, no. 3, 2012, pp. 196-207; Rikke Hostrup Hangbølle and Francesco Cavatorta, "Beyond Ghannouchi: Islamism and Social Change in Tunisia," Middle East Report, Spring 2012. Nouri Gana, "Postscript: Preserving the Exemplar," in The Making of the Tunisian Revolution, pp. 291-8. The New York Times, Feb. 7, 2013; Marina Ottaway, "Learning Politics in Tunisia," Viewpoints, Wilson Center, Washington, D.C., Apr. 2013; NPR News, July 25, 2013. Sarah Chayes, "How a Leftist Labor Union Helped Force Tunisia's Political Settlement," Carnegie Endowment for International Peace, Washington, D.C., Mar. 27, 2014. Sami Zemmi, "The Extraordinary Politics of the Tunisian Revolution: The Process of Constitution-Making," Mediterranean Politics, Mar. 2015, pp. 1-17; Duncan Pickard, "Prospects for Implementing Democracy in Tunisia," Mediterranean Politics, June 2014, pp. 259-64. Amna Guellali, "The Problem with Tunisia's New Constitution," World Policy Blog, Feb. 3, 2014; Sarah Mersch, "Tunisia's Compromise Constitution," Carnegie Endowment for International Peace, Washington, D.C., Jan. 21, 2014. Duncan Pickard, "Tunisia's New Constitutional Court," Issue in Focus, Apr. 2015. Mounira M. Charrad and Amina Zarrugh, "Equal or Complementary? Women in the New Tunisian Constitution after the Arab Spring," Journal of North African Studies, Summer 2014, pp. 230-40. Duncan Pickard, "Tunisian Politics after Constitution Making," Muftah, Apr. 22, 2014. Daniel Tavana and Alex Russell, "Previewing Tunisia's Parliamentary and Presidential Elections," Project on Middle East Democracy, Washington, D.C., Oct. 2014. Anne Wolf, "The Future of Tunisia's Nidaa Tounes Party," Middle East Institute, Washington, D.C., July 25, 2014. Intissar Fakir, "Tunisia's Election: Ennahda vs. Nidaa Tounes," Carnegie Endowment for International Peace, Oct. 23, 2014; BBC News, Oct. 30, Dec. 23, 2014. 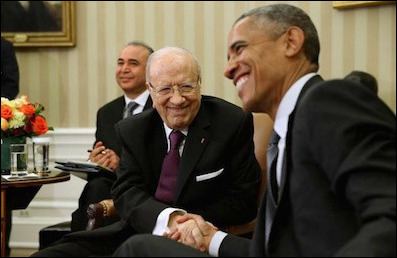 The New York Times, May 18, 2015; Tamara Coffman Wittes, "Security Interests Overshadow Tunisia's President Essebsi in Washington," Brookings Institution, Washington, D.C., May 19, 2015. The New York Times, May 19, 28, 2015. Oussama Romdhani, "North Africa: Beyond Jihadist Radicalization," World Affairs, Jan./Feb. 2015. The Washington Post, Oct. 28, 2014. The New York Times, Aug. 9, 2015. Paris Match, Mar. 22, 2015. The New York Times, Sept. 12, Oct. 24, 2014; Romdhani, "North Africa: Beyond Jihadist Radicalization." The Economist, Dec. 20, 2014. Nadia Marzouki and Hamzah Meddeb, "Tunisia: Democratic Miracle or Mirage?" Jadaliyya, Arab Studies Institute, Washington, D.C., June 11, 2015; Raphaël Lefévre, "Tunisia: A Fragile Political Transition," Journal of North African Studies, Summer 2015, pp. 307-11. Alexis Arieff and Carla Humud, "Political Transition in Tunisia," Congressional Research Service, Washington, D.C., Feb. 10, 2015. Tavana and Russell, "Tunisia's Parliamentary and Presidential Elections"; "Legislative and Presidential Elections in Tunisia, Final Report," The Carter Center, Atlanta, May 28, 2015. Related Topics: Democracy and Islam, North Africa | Daniel Zisenwine | Winter 2016 MEQ receive the latest by email: subscribe to the free mef mailing list This text may be reposted or forwarded so long as it is presented as an integral whole with complete and accurate information provided about its author, date, place of publication, and original URL.